The Hadassah Foundation's grantees were well-represented at the 9th International Jewish Orthodox Feminist Alliance (JOFA) Conference this past weekend. The more than 1200 in attendance were able to go to sessions that featured Rabba Sara Hurwitz (a former Bernice S. Tannenbaum Prize winner), and speakers from current grantees Shalom Hartman Institute of North America and the Jewish Women's Archive, and former grantee Moving Traditions. JOFA itself is also a former Foundation grantee. 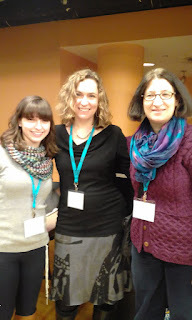 Many of the sessions focused on the growing number and influence of women who have been ordained and serving as clergy in the Orthodox world--a number of whom were ordained by the seminary that Rabba Hurwitz founded and still leads, Yeshivat Maharat. The Hadassah Foundation is seeking proposals for projects, curricula, and training programs that will enhance the leadership capacity of Jewish girls and young women ages 12-30 in the United States. All applications, to be submitted by email only, are due by February 10, 2017. The grant term will be July 1, 2017–June 30, 2018. The Foundation will provide a limited number of one-year grants of up to $40,000, and one three-year grant of up to $25,000 a year for three years.